Sarah Chavez is a Ph.D. student in the Department of Health Outcomes and Biomedical Informatics (HOBI). She earned a Master of Public Health (MPH) degree in biostatistics from the University of Texas Health Science Center (UTHSC) at Houston School of Public Health (SPH), and a Baccalaureate of Science (BS) degree in biology from the University of Texas at San Antonio (UTSA). Prior to enrollment in the HOBI doctoral program, Sarah participated in the National Institutes of Health (NIH) Summer Institute for Training in Biostatistics (SIBS). 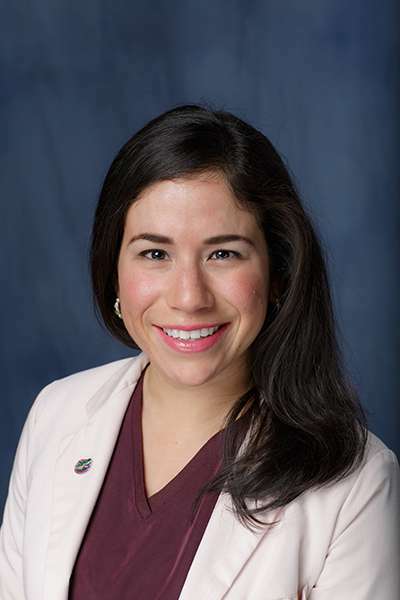 Sarah is a member of the 2014 UF Board of Education (BOE) summer fellowship program through the UF Graduate School, Office of Graduate Diversity Initiatives (OGDI). In 2015, she attended the American Association for Hispanics in Higher Education (AAHHE) as a doctoral fellow and presented her research at the national conference. Her interests in outcomes research guided her involvement as a graduate trainee in the 2016 Patient Centered Outcomes Research Institute (PCORI) Annual Meeting. She participates in extracurricular activities such as the UF Global Health Case Competition (GHCC), assists mentoring programs, and teaches group exercise classes. In addition to academics, Sarah is a full-time research coordinator III for the Institute for Child Health Policy (ICHP) External Quality Review Organization (EQRO) project. Centers for Medicare & Medicaid Services (CMS) federal regulations are followed to evaluate the quality, timeliness, and access to health care for Medicaid recipents. Her involvement with the Quality Improvement (QI) and implementation science team has shaped her efforts to align QI efforts and evaluate the effectiveness of quality strategies. She coordinates performance improvement project (PIP) evaluations and technical reports. Sarah’s research focuses on type 2 diabetes (T2D) prevention and management. She is interested in the quality of mobile health (mHealth) applications (apps) for managing T2D. The use of technology and mHealth app availability is increasing with research needed to determine the effectiveness of using mHealth in clinic and for patient self-management. She is also interested in comparing how apps impact healthcare provider-patient shared decision-making with standards of care. The ultimate goal is to educate and engage app users to make informed health care decisions. Her mentor is François Modave, Ph.D.
Cardel M, Chavez S, Bian J, Penaranda E, Miller D, Huo T, Modave F. (2016). Accuracy of weight loss information in Spanish search engine results on the Internet. Obesity (Silver Spring), 24(11):2422-2434. PMID: 27653438.